Hey NYC horror fans! Don't miss the premiere of Troma's FATHER'S DAY on February 10-11 that will have the director Astron-6 present and participating in a Q & A with Troma's very own Lloyd Kaufman. February 2, 2012, New York, NY - Greetings from Tromaville! 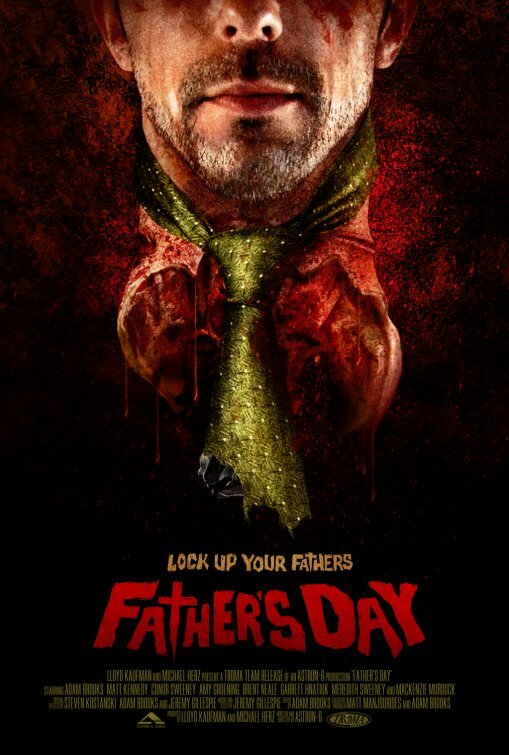 Lock up your fathers: Troma Entertainment is proud to announce the New York screenings of Father's Day at Sunshine Cinema on February 10 & 11 will now be attended by its creators, filmmaking collective Astron-6! Members Jeremy Gillespie, Steven Kostanski, Matt Kennedy and Conor Sweeney will be present for a Q & A session at the midnight premiere of Father's Day. The Q & A will be moderated by Father's Day producer, creator of The Toxic Avenger and President of Troma Entertainment, Lloyd Kaufman. Sunshine Cinema is located at 143 East Houston Street, New York. Tickets are now on sale online at https://tickets.landmarktheatres.com/Ticketing.aspx?TheatreID=256&ShowDate=2/10/2012 or from the box office. History of Astron-6: On March 3, 1969 the United States Navy established an elite school for the top one percent of its pilots. Its purpose was to teach the lost art of aerial combat and to ensure that the handful of men who graduated were the best fighter pilots in the world. Today, the Navy calls it Fighter Weapons School. The flyers call it: Astron-6. Established in 1974 by Yale friends Lloyd Kaufman and Michael Herz, Troma Entertainment is one of the longest-running independent movie studios in United States history, and one of the best-known names in the industry. World famous for movie classics like Kaufman's The Toxic Avenger, Poultrygeist: Night of the Chicken Dead, Class of Nuke'em High, Mother's Day and Tromeo and Juliet, Troma's seminal films are now being remade as big budget mainstream productions by the likes of Brett Ratner, Richard Saperstein, Akiva Goldsman, and Steven Pink. Among today's stars whose early work can be found in Troma's 800+ film library are Trey Parker, Matt Stone, Jenna Fischer, Robert De Niro, Dustin Hoffman, Kevin Costner, Fergie, Vincent D'Onofrio and Samuel L. Jackson. Visit Troma at www.troma.com, www.lloydkaufman.com, www.twitter.com/lloydkaufman, andwww.tromapast.tumblr.com.